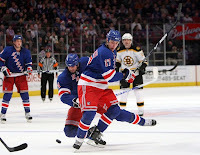 This past Friday the Rangers defeated the Florida Panthers, 4-3, in a shoot-out. However, the game quite honestly left a bad taste in my mouth. You go up 2-0 early in the game, sit on the lead, then make your MVP Henrik Lundqvist single-handedly turn back shot after shot on a 5 v 3 penalty kill. Then, of course, you give up a late goal that ties the game and somehow you manage to win it in a shoot-out... not very impressive. A far too common happening for this former player. A win? Yes. But there's a problem bigger than you think! Which leads me to today's matinee game at The Garden. You know the place that team's don't want to play (just kidding). The Florida Panthers came in and looked like an all-star team compared to the Rangers. The Panthers skated to an easy 4-0 shut-out (first time all season the Rangers got shut-out, believe it or not). Led by Craig Anderson's play in the net for the Panthers, the Panthers just did everything right. They were quicker, faster, outhustled, outhit, and outplayed the Rangers up and down the ice. The Rangers were, simply put, horrible. No one came to play and if anyone thinks differently, then they're in la-la land. Who's to blame? The fans seem to think it's Rozsival's fault. Oh, really? The no-score, no-hit, no-powerplay, no-support for Lundqvist is all Rozy's fault? The top players did not step up. The lack of hustle overall was embarassing. You can't sugar coat this! It is what it is. With Pittsburgh coming into town with their elite group of players, the Rangers have plenty to worry about in the next few days. Over and out! I was away doing the radio for the Quinnipiac Bobcats on Wednesday, so I can only go by my hockey expert son's report on the game. It was a nice 3-2 shoot-out victory by the Blueshirts. Markus Naslund's 2 goals, Ryan Malone's PP goal, and a late deflected goal by Tampa forced a scoreless OT. With goals by Naslund & Zherdev, combined with stellar goaltending by Henrik Lunqvist - the Rangers shut-out and shut-down the Lightning in the shoot-out. I really can't say enough about the King. He's been a saviour all year for the Rangers. Where would the team be without him? A very entertaining game... a couple of fights: Orr and Koci, even Zherdev and Stamkos?! These I have to see on youtube! Back in first, a good win on the road, we'll take it! The Quinnipiac Bobcats took on the number 7 ranked Princeton Tigers in a ECAC conference game last night. The Bobcats, however, fell short 2-1. Bud Fisher stopped 39 of 41 shots in a great, but wasted effort as the Bobcats could only muster a goal by Brandon Wong. I have come to realize in college hockey that there is a fine line between a great team and a good team. The difference is ever minute. The Bobcats came out of the gates slowly in the first period, played even in the second, and really outplayed Princeton in the third. Unfortunately, they still came up with a tough loss. Over and out! In a game that the New York Rangers needed, they came up with a pretty good effort and a nice 4-1 victory over the Phoenix Coyotes. The game started in a very familiar pattern as Henrik Lundqvist fended off at least 3 to 4 great scoring chances to keep the Rangers in the game. 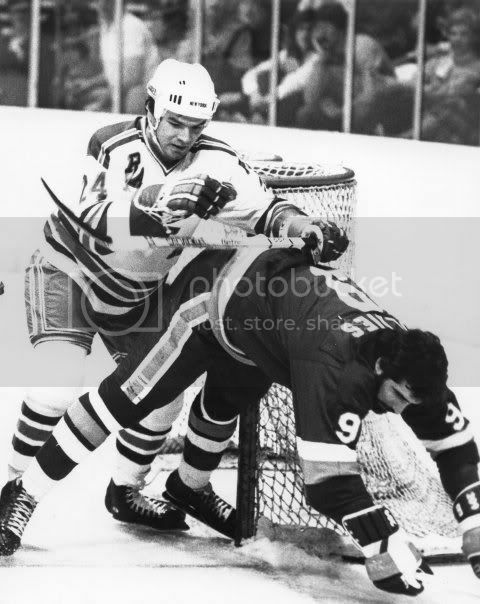 Phoenix did manage to take a 1-0 lead on a goal by Lisin, but the Rangers came back with a goal by 4th line center, Blair Betts (Who showed some pretty nifty hands in beating Bryzgalov after taking the pass from Zherdev). Brandon Dubinsky then made it 2-1 on a wrap around goal that made up for the goal post that he hit in the first period. Again, Nikolai Zherdev with the assist. Dan Girardi then made it 3-1 on a blast from the point on the PP (Wait... did I just say a goal on the PP? ), with an assist from - you guessed it - Zherdev. Lastly, Scott Gomez added an empty net goal late in the 3rd period to cap off the victory for the Rangers. Now, my thoughts on the game. Again, King Henrik was the key in the opening minutes (Why can't this team come out of the gates breathing fire?). Dubinsky played with a great deal of passion tonight and even registered a Gordie Howe Hat-Trick (Goal, assist, and a fight)... not bad! 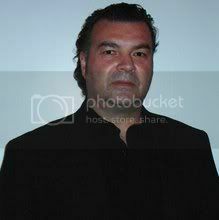 Nikolai Zherdev proved to me that it's all about effort with him. The talent is not in question, the effort and being inspired is. When Zherdev plays with no effort, he becomes uninspired... when the opposite occurs, he's one of the best in the league. Also, kudos to Scott Gomez... getting back in the lineup for him has got to be satisfying. Gomez picked up an empty net goal and skated very well tonight, it was good to see him back. Overall it was what the Rangers needed: a win. There's still some parts of their game that need to be fixed though, we all know that! Well, onto the next one! As for the Qunnipiac Bobcats, I was in upstate New York with the Bobcats in Potsdam for 2 games over the weekend. The "Road Warrior" act continued on for the Bobcats. First, they took game 1 on Friday with a score of 4-2 over Clarkson. In that game the Bobcats were led by David Marshall's 2 goals and solid goaltending by Bud Fisher. The Bobcats dominated for the first 2 periods and managed to hold on for the win. On Saturday, the Bobcats took on St. Lawrence looking for their fourth straight win on the road. Captain Dan Henningson's 2 goals lead the way as the Bobcats finished the road trip with a 5-2 victory over the Saints of St. Lawrence. I think these past 2 weekends, the Bobcats are finding their way as to what type of team they are. Coach Pecknold and his staff has gotten the team buying into what's been taught and that's all you can really ask for. In my opinion, it's tough to win on the road and the Bobcats have proved to me that they can win on the road at any time and at any place. Up next, the Princeton Tigers. I will be there doing the color commentary with my man Bill Schweizer, who will be doing the play-by-play. Check us out on Wednesday at 7:00 PM EST. Over and out! Finally, the weight of the world has crashed down on Henrik Lundqvist. Last night, he and the Rangers were defeated by the Vancouver Canucks, 6-3. The King was yanked after giving up the 5th goal in the 2nd period (Lundqvist surrendered 5 goals on 17 shots). It was a mercy pull for Lundqvist, who is clearly the teams backbone. I attended the game and was able to watch closely as I sat in the Legends Section with Rod Gilbert and Glen Anderson. The King was really let down by the performance of the team in front of him. However, on the bright side, Steve Valiquette took over and did a fine job in relief. Overall, I thought Vancouver was the quicker and faster team early on (The Rangers looked slow). The Canucks built a 2-0 lead and I honestly knew that it was over. With the lack of scoring all year long, what would make me think any differently? Sure, the Rangers tried to pull a monumental comeback, but in the end the 5-1 Canuck lead was too much for the Blueshirts to handle. It was not a very good game for the team. A lousy start as usual and the result is what you should receive. Kudos to Vancouver though, they played a good game. My wife and I enjoyed the company of my former teammate and good friend Ron Greschner (along with his posse of friends), as well as Larry "Ratso" Sloman - writer extraordinaire. Ratso's writing a book on Mike Tyson... it should be a good one! It was not a good night for the Rangers. For me though, it was great to attend a game and see old friends. I will be away doing 2 games this Friday and Saturday for the Quinnipiac Bobcats. Check out the link below and give the games a listen. Over and out! What ever the New York Rangers are paying Henrik Lundqvist, it's definitely not enough. The players should pass the hat around the dressing room and hand part of their salaries to The King! In what seems to be a familiar pattern this season, the Rangers pulled another magic track with a 2-1, shut-out victory over the Ottawa Senators on Monday night. A goal by "Fast Freddy" Sjostrom evened the score in the middle of the 3rd period at 1-1. Sjostrom made up for a weak stick check (he should have took the body) on Daniel Alfredsson's goal in the 2nd period that gave Ottawa a 1-0 lead. Once again, the "powerless play" was in effect. Goal scoring by the Rangers was yet again absent. I don't understand the lack of scoring... the coaches and the players have just got to be numb over it as well. It's mind boggling! The story really was Henrik Lundqvist. 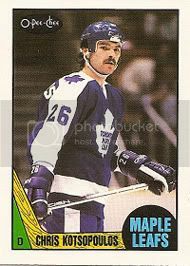 The King took on a determined Senators squad, who clearly had many great scoring chances throughout the night. Lundqvist, being his usual calm and cool self, turned away the Senators chances - time after time. The game went to a shoot-out where Nikolai Zherdev fired a 5-hole winner through the legs of Alex Auld. The King did what he does best by shutting out the Sens in their attempts during the shoot-out. How much longer can the Rangers continue winning with their lack of scoring? It all depends. But, I guess it really just comes down to how long will Henrik Lundqvist allow them to. By the way, I will be attending Wednesday's game at MSG against the Vancouver Canucks. It should be an interesting affair. Lets go Rangers & over and out! Hockey is a 60 minute game and if you're a Boston Bruin fan, you're sick to your stomach. If you're a New York Ranger fan, your stomach's feeling a whole lot better thanks to the 3-2 win over Boston on Saturday night at the Garden. With 2 goals in the last 5 minutes of the game by Nigel Dawes and Markus Naslund, the Rangers advanced to overtime period and with Chris Drury's shootout goal (a nice 5 hole shot through Tim Thomas' legs) combined with Henrik Lundqvist's save on Patrice Bergeron - the Rangers escaped the jaws of defeat and came out with a much needed victory. It wasn't pretty for the Rangers for 55 minutes. Lots of missed opportunities, a "Powerless Play" on display once again, and being completely out-physicaled all over the ice. To the Rangers credit, they finished the game strong - where as the Bruins sat on it a bit and it ended up costing them a game that they should of won. Were the Rangers lucky? Yes. Bruins unlucky? Obviously. But, that's just how the puck bounces (no reference to Rozsival). Over and out! In other happenings, the Quinnipiac Bobcats have bounced back with 2 wins. 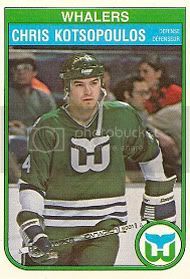 Friday, they took care of Union, 6-3, in a game where Brian Leitch (no, not that Brian Leetch) broke out of a scoring slump with 3 goals and 2 assists to lead the Bobcats. Saturday's game went to the Bobcats as well, with a score of 5-1 over Rensselaer (RPI). Eric Lampe finally tallied his first goal of the year as well as an assist. 2 big wins by the Bobcats on the road which puts them back in the thick of things in the tough ECAC with a record of 4-4-1 overall and 2-2-1 in the ECAC conference play. Someone once told me a long time ago, "You're never quite as good as you think, and you're never quite as bad, either". Well, I think that's where we are with the New York Rangers. After 18 games, the Rangers sport a pretty good 11-5-2 record. I believe in my heart that if we were told before the 2008-2009 season started, with all the new faces and turnover, that the Blueshirts would be 11-5-2 - we all would of done cartwheels. Yes, there are problems... but which teams in the NHL don't have problems? Sometimes we, including myself, tend to overrate certain players and really underrate others. I leave that to the fans and my fellow bloggers to figure out who is and who isn't. This team is built a certain way. So far, the record proves that it's working. But, this team is going to have to get tougher and more physical. As of right now, they are not (Are we sure that we don't miss Avery?)! As for beating a dead horse: lack of offense and inability to take advantage of the PP opportunities were at the forefront again last night. Players have to take special pride that you have been given the privilege to be on the PP. It's a "free chance" to help your team win hockey games. Also, I'd like to address the issue of protecting your own goalie. If your goalie gets run over by an opposing player, there must be retribution. If teams feel that you are soft, then they will take advantage of that. I don't care if you're a tough guy or not... you must defend your goaltender. 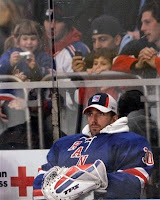 Especially King Henrik! He is your best chance at being able to go far into the Stanley Cup Playoffs. With a 3-1 loss to Washington and a shoot-out loss at home last night to the Edmonton Oilers, the Rangers are still in a good position to be a force when it counts. They will still have to address the obvious glaring needs, but I believe the brass is well aware of the problems the team has... no time to panic just yet! Now, on to my other favorite hockey team, the Quinnipiac Bobcats. They are almost like the Rangers at this point. Lack of scoring has diminished outstanding goaltending by Freshman Nick Pisellini. The Bobcats have been shut-out for 133+ minutes of hockey. I covered 2 games over the weekend and the Bobcats were defeated 1-0 by Colgate and played to a 0-0 tie against Cornell. I'm pretty sure that coach Rand Pecknold of the Bobcats is pleased with the overall defense of his team, but not too happy about the lack of scoring. Anyways, if you're interested, they play tonight against Princeton... check it out. Oh yeah, I have another article posted on the Fourth Period (About the Maple Leafs). Please give it a look! Over and out! Chris Drury and the New York Rangers solved 2 problems in one night. 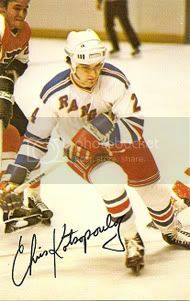 Firstly, Drury's 1st hat trick as a New York Ranger, which led the Rangers to a 5-2 victory over the Lightning. And secondly, the power play actually showed some power for once by going 2 for 7. After a terrible display against the Islanders this past Monday night, the power play actually looked threatening for once. I hope that it continues to thrive, because this team draws a lot of penalties and they need to capitalize on their chances. Now, on to Drury. There's been a lot of head shaking going on about Drury's lack of production. Tonight, at the very least, gave the Rangers fans a sign of good things to come. Drury's shorthanded goal was a thing of beauty. You could tell by Drury's reaction just how big of a goal it was. I hope a night like this will bring consistancy to his game. Other thoughts on the game: Tampa is not a bad hockey team. They outshot the Rangers by a 38-35 margin. Coach Melrose will have this team chalenging for a playoff spot, trust me! Also, I wonder what kind of reaction the NHL will have on Tampa Bay goaltender Mike Smith due to his repeated chops on Aaron Voros in front of the net (remember how quickly the NHL acted after Sean Avery's "playoff antics"?). I, for one, see nothing wrong with this as this was a normal part of the game in my day. Aaron Voros was just doing his job. After all, this is what the league wants, "no touch hockey in front of the net". So, this is what you get. And can somebody please tell me by today's rules, what should a player/goaltender/defenseman do? I have no idea. But one thing's clear, you can't protect one (goaltenders) without protecting the other (skaters). Over and out! Oh, and also, I have 2 games this weekend (Friday and Saturday nights). Colgate and Cornell visit the Quinnipiac Bobcats in 2 important ECAC match-ups. It should be a very entertaining couple of games. Please, check it out on the radio! Unfortunately, the New York Rangers took it on the chin last night when the new look Toronto Maple Leafs knocked out the Rangers with 5 goals in the last 7:25 of the 3rd period. I did not get to watch last night's game, but from what I have gathered, it was a major collapse by the Rangers. They obviously thought the game was over and decided to cruise to the end. A lesson has to be learned here, and that lesson is that you must finish off teams... not let them hang around. If the players don't learn from this, then shame on them. One other thing, what's up with the PP? Not very good at the moment. Any how, as I mentioned, I did not see the game (probably better that I didn't). So, I will rely on my fellow fans to respond. Now, on to the Quinnipiac Bobcats, who played their home opener last night. The Bobcats prevailed with a 4-1 victory over a gritty UConn Huskies hockey team. The Bobcats were lead by David Marshall's 2 goals with Scott Zurevinski and Brandon Wong collecting 1 goal each. To me, it was a very entertaining game. Good skating, lots of big hits, and great goaltending on both ends of the ice. The Bobcats were the better team and if not for the fantastic goaltending by Beau Erickson of the Huskies, the score would have had a much wider margin. Nick Pisellini started in goal for the Bobcats and made some key saves when called upon. In the end, the game came down to special teams. UConn went 0-5 on their PP attempts and the Bobcats were 2-6. That was the difference in the game. Special teams are important for any hockey team at all levels and if you excel at them, you will win more than you lose. Tonight, Quinnipiac played hard, won the battles, and it was a much needed and well deserved win. Over and out!